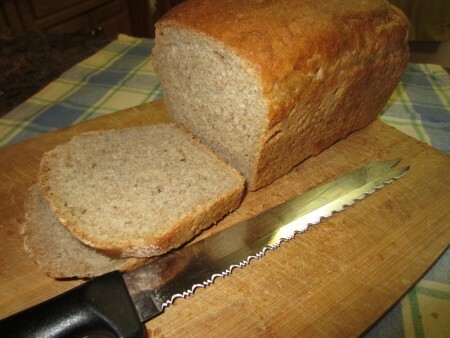 SOUR DOUGH BREAD – this recipe makes 3 – 1 1/2 pound loaves of delicious healthy bread (I weigh mine & make another tiny loaf if there is any extra) This recipe is a fermented 50% spelt flour / fermented 50% unbleached flour bread. To make this bread you will first have to make a starter that will take about a week. (Unless a friend has shared some fermented starter with you) Once you have it & feed it, you will always have starter for future bread, crepes, pancakes or other recipes without using any bought yeast. If your starter was made with unbleached flour, you can change it to any other flour by feeding it with the kind you choose. Stir together vigorously. Cover with a thin cloth and secure with a rubber band. Cover with a towel. Each day feed the starter with 1 cup spelt flour and 1/2 cup filtered water. Beat well, & cover again. Yesterday I started feeding the starter each day with 4 ounces flour and 4 ounces water instead of the above, so I will see if there is a difference. I read other people’s advice and try some of it to see what works best for me. My aim is always for tasty, healthy well risen loaves of bread! Day 7 – today you have already fed the starter. In a few hours, or as soon as it is bubbly on top it is ready to use to bake bread. Measure the starter, saving at least a half cup for the next starter. Feed this saved starter one more time; cover it as usual, set aside & proceed to feed as you did for the previous starter. This way you will always have starter handy for the future. As soon after the feeding, when it has bubbles on, it is time to mix the bread dough as mentioned below. Now that you have created the yeast, you will not have to wait a whole week, but can bake more bread as long as the starter bubbles and when you have enough starter for a batch. Baking this kind of bread has been a huge learning curve for me. Until lately we always loved that fluffy whole grain bread that I could bake in just a couple of hours. As well I have always prided myself in making our bread from 100% freshly milled whole grains. But now after reading research I have learned that the fermented sour dough bread is much easier to digest as it has gotten rid of much of the phytic acid and lectins that are in all grains. This sourdough bread provides our bodies with way more beneficial nutrients. A few months ago Melvin was put on a no yeast diet so I was forced to make this change and use the yeast that comes from the bacteria in the air rather than bought yeast. I tried quite a few recipes that were not as satisfactory as I would like, so I made my own recipe and after many trials, I was blessed with really nice looking tasty bread. By the way, I never threw out these really heavy loaves, but dried and blended them into bread crumbs. They are in the fridge to use when breading meats. I have found that the final amount of flour you add to the dough will depend on how thick your starter is, so one has to add until the dough is firm but still moist. The recipe I am giving was just right yesterday, but next time I may have to use less or more flour. I am using part unbleached flour so the loaves will rise well. In time I may try to use more spelt flour and less unbleached. Because I leave these loaves to rise 8 or more hours, the flour I add has also become fermented. The longer they rise, the better. They don’t rise anymore after I put them into the oven so I try to let them rise until it seems they stop. I have also found that the best way to let it rise in on the counter with a towel over. When I have tried to put them near heat or in the oven with the light on, the top layer rises more and the bread separates at the top. This bread rising cannot be rushed. I need to know that I will be home in 8 – 12 hours; when the loaves have risen just right. I also brush the tops with oil after shaping the loaves and then as well after they are baked. This allows me to slice all of the loaves nice an thin and freeze them that way. I can then take out as many slices as we want. Yesterday I noticed a few holes in one loaf. I would say I hadn’t kneaded this one quite as much as I should have. I guess practice makes perfect, or at least better! One article I read suggested to add ginger powder if we are not using sugar in the dough. I am just guessing at the amount to add, but this time it worked so, why change a good thing? I always feed the starter, wait a few hours until the dough has bubbles on top and then measure out the starter for a batch of bread. Put the following into your Bosch Universal Dough Mixing Machine bowl. Knead 10 minutes. With greased hands, divide the dough into 3 equal balls and shape each into a firm smooth loaf. Place in bread pans and brush with a little avocado or melted coconut oil. Cover with a towel and let rise until at least double in size. Bake at 350 ‘ F for 40 minutes. (or until nicely browned) If you are unsure, you can check to see if the inner temperature of a loaf is at least 190 ‘ F.
Remove the loaves from the oven and brush with oil or beaten egg. Lift loaves from the pans and let cool on a board before cutting into them. I found this to be very important. I bought a loaf of sourdough bread and it was sliced thin as well so I copied this idea and like it! It is also a good way of getting less carbs in a day as a thin slice is just less!